Apple Enchiladas - Perfect For A Healthy Breakfast! Homemade apple enchiladas, comfort food hot from the oven! 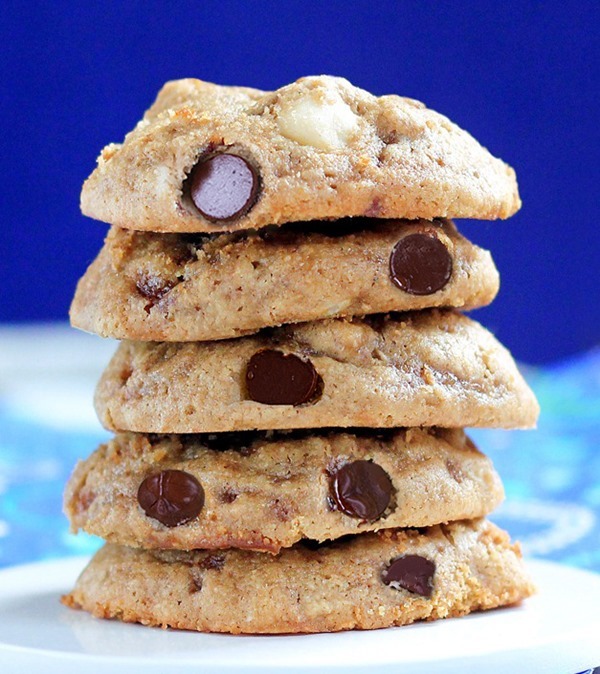 Just 8 ingredients, and they’re vegan and oil-free! If you like apple pie, you will love these wholesome apple enchiladas. They remind me of apple blintzes, but are so much better! Serve them hot or cold for a delicious breakfast, or top each with homemade Coconut Ice Cream or Keto Ice Cream for a healthy dessert. I also topped mine with homemade Coconut Caramel Sauce. It was basically like eating a giant caramel apple covered in creamy vanilla ice cream and stuffed into a warm tortilla. And while I know apples are normally a winter dessert, eating these enchiladas always makes me think of a summer fair. They’d be perfectly at home alongside other typical fair foods like funnel cakes, popcorn, corn dogs, and deep fried oreos. Or whatever they’re deep frying these days. When I lived in Texas, I learned that pretty much any food you could possibly imagine can be deep fried. Anyway, but these apple enchiladas are BAKED, not fried. This is culinary fusion at its finest. The hot-from-the-oven apple enchiladas give you all the cinnamony goodness of hot apple pie stuffed securely into a tortilla and baked to a bubbly perfection. 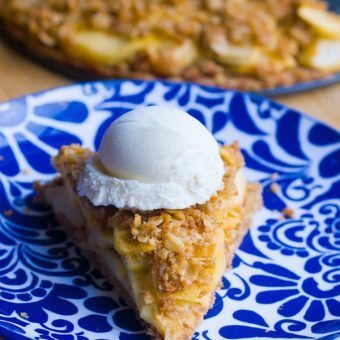 While traditional apple enchilada recipes can call for up to an entire cup of sugar and a large amount of butter, this version has been lightened up considerably, making it a delicious indulgence for dessert or breakfast. For the optimum dessert-enchilada experience, don’t forget the ice cream! I’m going to stop with this list now. Because, yikes. 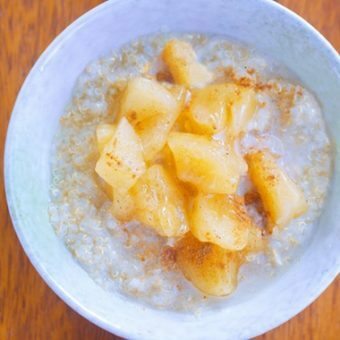 Place 2 cups of the chopped apples in a medium saucepan with the water. Bring to a boil, then cook on low heat for 8 minutes. Meanwhile, combine remaining 2 1/2 cups apple with all other ingredients in a blender, and blend until completely smooth. After the 8 minutes, add the blender contents to the saucepan and bring to a boil again. Once it begins to boil again, turn heat to low. Cook 30 minutes, stirring very occasionally (about 3-4 times). Let cool, then put in the refrigerator, uncovered. Wait at least 4 hours before proceeding with the rest of the recipe, as this filling will thicken as it cools. For the apple enchiladas: Preheat oven to 400F, and lightly grease an 8-in square pan. Portion about 1/3 cup of filling in the middle of each of 4 tortillas, roll up, then stick into the pan (seam-side down). Cover with the remaining sauce. Bake 28 minutes. Serve warm or cold, with ice cream of choice. 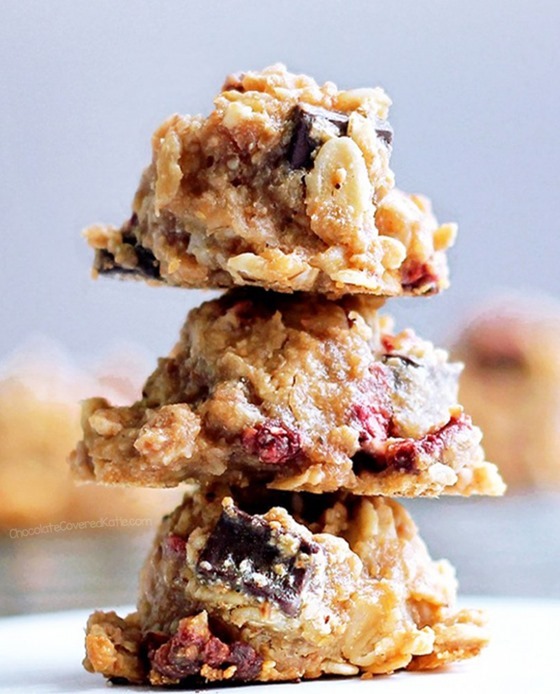 « Homemade Blueberry Oatmeal Bars! Oh yum! I love apples (second to chocolate, of course 😉 ). Perfect timing for fall too. Can’t wait to try! 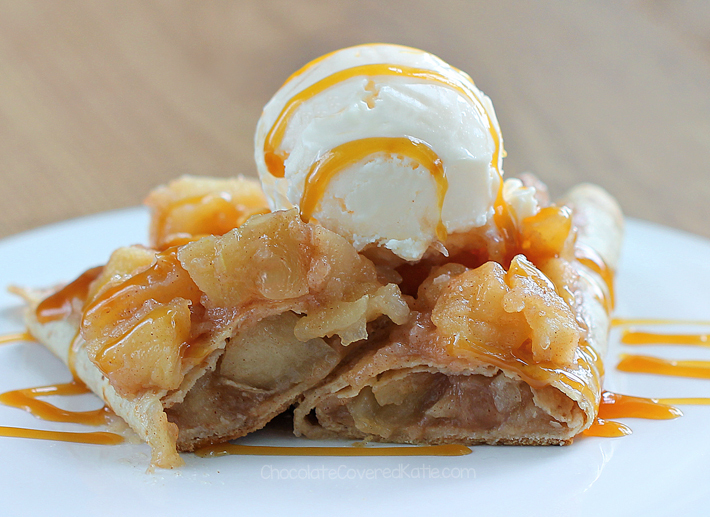 I have a recipe for baked apple pie egg rolls that I love, but I’ve never seen apple enchiladas before! 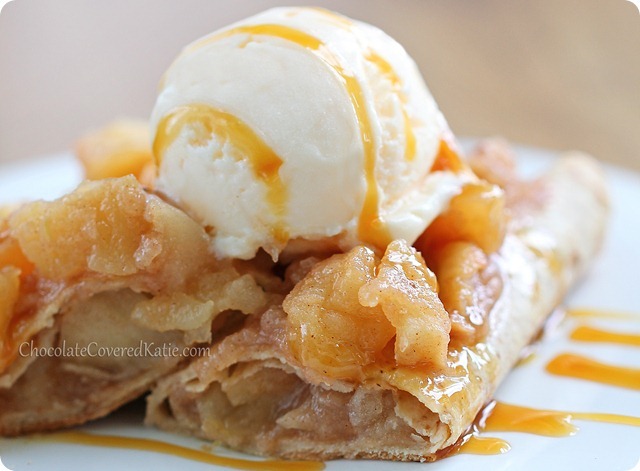 I don’t really like pie crust, so this sounds like another great way to get an apple pie flavor without the crust especially when topped with a scoop of ice cream! These look delicious. 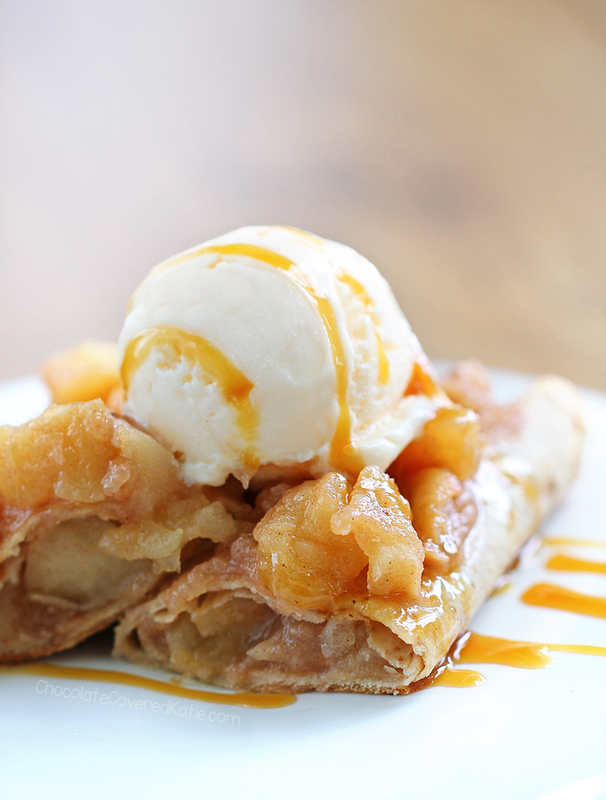 There is nothing I like more than warm apple pie with vanilla ice cream. Beautiful pictures as always! 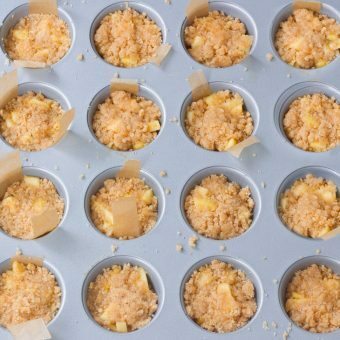 These look so yummy – what a great Fall dessert! I bet pumpkin-twist on these enchiladas would be delish, too. You are speaking my mind about the pumpkin! Have you been reading Moosewood New Classics? They do apple quesadillas in there! These look amazing! Coincidentally, I had a breakfast almost exactly like this, this morning. Except I used a crepe instead of a tortilla and put cream cheese in the middle as well as apple filling. Can’t wait to try this recipe, seeing as how I have tons of apples to use up. These look amazing! I’m going apple picking in a couple weeks, so I’ll make sure to pick a lot more to make these! Ah but the definition has changed over the years as different varieties have emerged. Now there are Enchiladas suizas (white sauce) and Entomatadas (tomato sauce). And now apple sauce! Yes, the varieties have changed over time, however; “enchiladas,” have still remained the same, they have always contained chile. Entomatadas and Suizas as you suggest still have chile in the recipe, hence why they are a variation of enchiladas. These look delicious, except I’m on a grain-free diet. I found these tortillas that would go perfect with this recipe: http://www.againstallgrain.com/2011/05/04/grain-free-tortillas/ for anyone interested in also excluding grains. You’re such a genius, Katie! 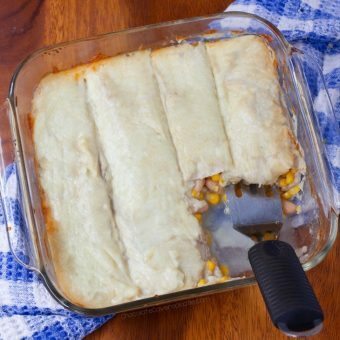 The apple enchiladas look so comforting, and perfect for autumn! I’ve been making my own tortillas lately and this will be the perfect use for them! I am so excited for apple season. These look delicious! I thought you had me at “apple enchiladas” BUT then I read that I can eat them for breakfast. Count.Me.In. Wow these look so simple but packed with flavor. 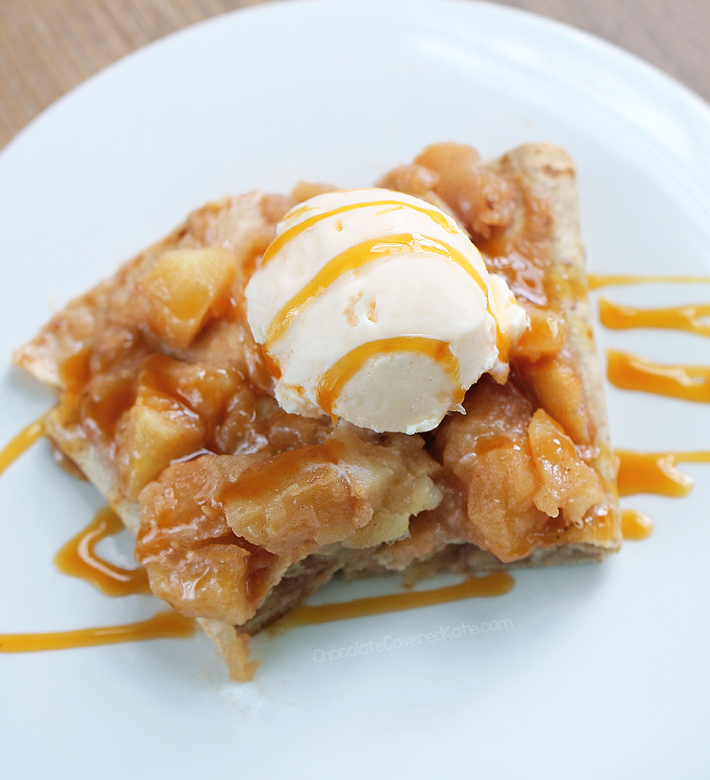 Also it’s apple pickin’ season so this is another great way to use up all the apples! I love that you took enchiladas and made them sweet, such a great idea. And now that Fall is on its way the apple flavor is spot on. 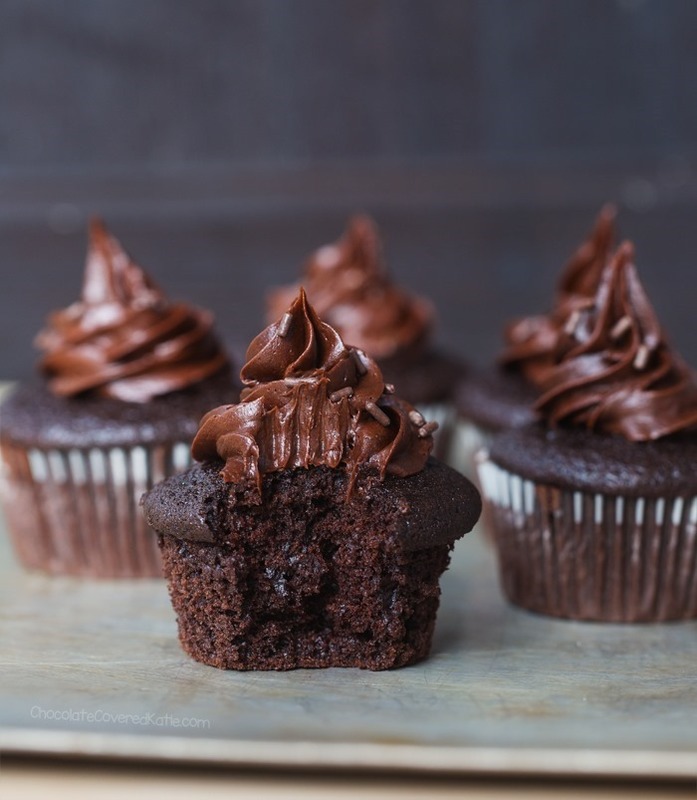 I love how you lightened up the recipe and used stevia instead of sugar. I need some of that ice cream, too! I’m all over these! Delicious!